It’s that time again; a time I have yet to learn how I should better handle. It’s the end of the season. Ugh. I do not like the end of the season. Let me put it in my own words, and see if anyone else can relate. I know that I don’t always make sense, but I’ll give it a try. This might take awhile, but hey, it’s been 105 days and counting, until the banquet I suppose. There’s a lot to discuss. Last night I found myself looking back at an email from November 29th, 2015, the night before tryouts. I read through it and revisited the thoughts, anticipations, questions, and emotions that I had that very night. Little did we know then, that just hours later, four of our players trying out would ‘lose their lunch, or breakfast, or dinner’ as it were, while skating during the first 530am ice time of the season. Many of you may have known, but I didn’t know how all of this would come together, so I will try to take you down this path in some particular order. Okay, there may not be any order. Who knew it was so hard to move a hockey bag? I mean they can get heavy, and you usually know you’re near one long before you can see one. Oh, the smell! Seriously though, we spent the first week of the season chasing a hockey bag all over SAU 19. Kids can ride the bus, come and go from school, get to practices and such, but, oh that hockey bag, who knows its’ travels. See, the hockey bags and hockey sticks can’t ride a school bus. This requires a lot of planning, structure that wasn’t yet in place, or exquisite communication and good gas mileage. I did get to see the Holt’s beautiful property, you know, right up next to the North Pole, on one or two trips to retrieve a hockey bag. I also spent some time with Sebastian one afternoon trying to figure out just where his hockey bag had traveled once practice ended that morning, before school. I will say this though, the older kids were awesome, helpful, and willing to help the newbies, the youngsters. For that, we are all thankful. One of the things that tears at my core when a season, that I love, comes to an end, is the finality of the chaos that had turned to a sort of rhythm of normalcy for a period of time. I immediately miss the alarm going off at 4-something-AM, and picking up a teammate or two on the way to St. A’s. I miss the teamwork it takes from the parents to help us all get through week after week of a long winter season. I miss seeing the boys all scramble from their vehicles in the dark of early morning when the rink door is opened. I miss the not-so-painful relentless onslaught of questions to do this, that, or the other thing because “everyone” on the team is going here or there. One day soon, I’ll miss even more, being the ‘ride’ to all things pertaining to a season. I do love the energy that is found in a group of people working together towards a common goal. The team. The coaches. The parents. The board members. It’s awesome! To be a part of something bigger than yourself will never grow tired with me. Game nights turned into organized mayhem, which led to just another chance to see friends, new and old, and have a blast watching our team play. I am thankful for the folks that pull these things together. They are parents, friends, families, schoolmates, coaches, educators, and administrators. I enjoy the opportunity to help and be a part of the presentation that is our team, our sons, our future. It’s about the kids, and I love that. Games, home and away, always a chance for the kid down the street, or the one from the next room, to do something you might have questioned he possessed the skills to do. You never know what’s going to happen next, and that is one of the beauties of sport. Walking into some far away rink, knowing that the Grizzlies were going to be skating for all to see, as we watch with the anticipation of what’s next. Looking around the rink, any rink, and seeing those familiar faces, knowing we all got each others’ back as it relates to supporting our team; there is a quiet confidence there. I hope the team feels the same. There are highs and there lows as life would have it. Yet, the show must go on. Life lessons presenting themselves on a daily basis, and it’s all right there for us to be a part of, together, as a community. Watching the youth and the experience come together to be one, with both being better for it. The exuberance of achieving individually is fantastic, but fails in comparison to the sheer joy and sense of accomplishment when teammates celebrate you, us, with you. Oh, to be that kid again. Maddie Carlson Night, Comedy Night, Charity of Choice, Goffstown Food Network, fundraisers, volunteerism, team bonding, outings, and more. Wow! What a group! The team donated $800 to help Maddie Carlson’s family with medical bills and expenses. They donated $1000 to the Northeast Passage Sled Hockey Program and were also honored, in turn, when the NEP team named Goffstowns’ 3 seniors as honorary coaches on their bench during a tournament game out in Exeter. Members of the team also helped the Goffstown Food Network move hundreds of pounds of food from one location to another at Christmas time. What a season. One day kids will grow to be men and women, adults, and I hope they realize sooner, than later, the effect they have on so many. You never know who is watching. You never know who needed to see any of us give of ourselves, help another, support someone else, refrain in the right moment, demonstrate humility and patience in another moment, or just smile to let the world know we are having a good time. Impact. Most times we don’t get to choose who we impact, but we always get the chance to choose how we carry ourselves, thus directing how we impact. None of us are perfect, even though Ethan Smith did stop every shot he faced in games this year, we all have our moments. If you read the first sentence of this paragraph, you will know what I mean, as it relates to this team, this group. Hundreds, if not thousands, of little moments packed into a season. I wish I knew of all the acts of kindness, caring, support, and even tough love that went into everyone that was a part of this season because I would share it. It’s a great group. I know I will miss the ones moving on, yes, even though some of these folks I have just met or started to get to know. That’s how ‘team’ works. I have shared in the honor of relaying facts, stats, messages, updates, stories, comments, and numbers regarding this team all season. If I were better prepared, maybe I would have captured more of the sentiments shared throughout the season. There have been so many comments praising this team and the group that make it all happen. Really, it’s been wonderful to read and hear. Listed below I have gone back through messages and comments I have seen all the way to early December, right through to this week. Honestly, I am humbled by the support of the write-ups, blog posts, articles, or whatever they are called. The support, kind words, and feedback from Grizzlies Nation has been overwhelming. I am truly thankful just for the opportunity to contribute along with everyone else. 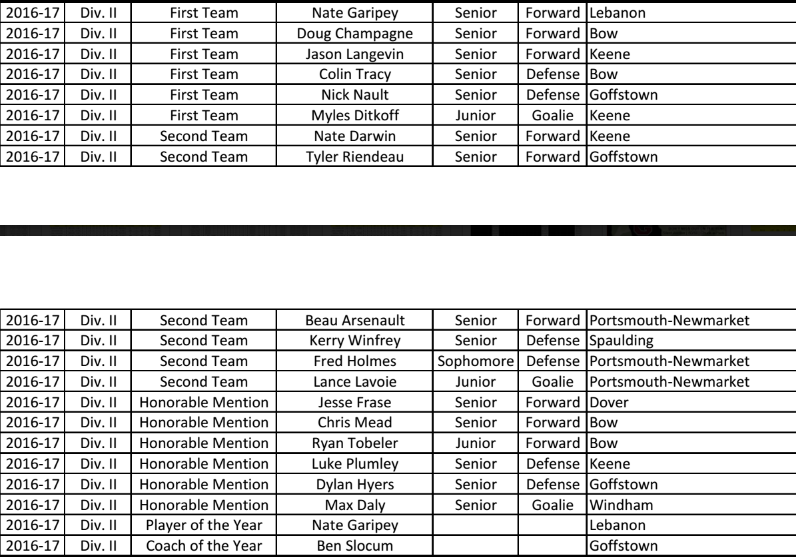 There are so many people, between the coaching staff, the players, the trainers, the bus drivers, the parents (of past and present players), the Friends of Goffstown Hockey, the school folks, and so on, that do so much to make a season even possible. It’s about all of them, supporting the kids. Thank you all for letting me be a part of this 2015-16 GHS Hockey season. It has truly been my pleasure. So, another season goes in the books. Which is another thought that I had. Are there actually books that track each season? The records. The stats. The schedules. I will pursue that lead separately. Anyway. In an attempt to close this out, I go back to the word, impact. Impact is defined this way; the action of one object coming forcibly into contact with another, or, the effect or influence of one person, thing, or action, on another. Maybe it’s just me, but this season, right from tryouts through now, has impacted me. Maybe even forcibly come in contact with any of us. Certainly there has been ‘effect’, and most definitely influence on another. Personally, I think the impact has been positive. I do believe the team, the sum of its’ parts, is better today than they were when the roster was announced on December 2nd. I do believe the players are better players, up and down the roster, than they were when we started. I think the coaching staff had an impact, a positive one at that, right out of the gate. I heard it in the voices of the returning families, I saw it in the smiles on the players faces. I felt it being around the rink and witnessing the countless gestures of kindness and support. The kids broke out of the secrecy and security found in any good locker room environment, crossing the threshold back into the reality of life away from that sacred sanctuary found at the rink, often times greeted with brownies, cookies, or some other baked goods. There was impact, and it was everywhere. Did Maddie Carlson night have an impact on anyone? Oh, I know it did. Did Maddie Carlson herself, have an impact? Absolutely. Did we all, the entire GHS Hockey community, have an impact on Maddie and her family? I am quite certain we did. Seeing and hearing Maddie’s mom having a blast at the comedy show was worth the price of admission alone. (Segue way) How about the Comedy Night Fundraiser? 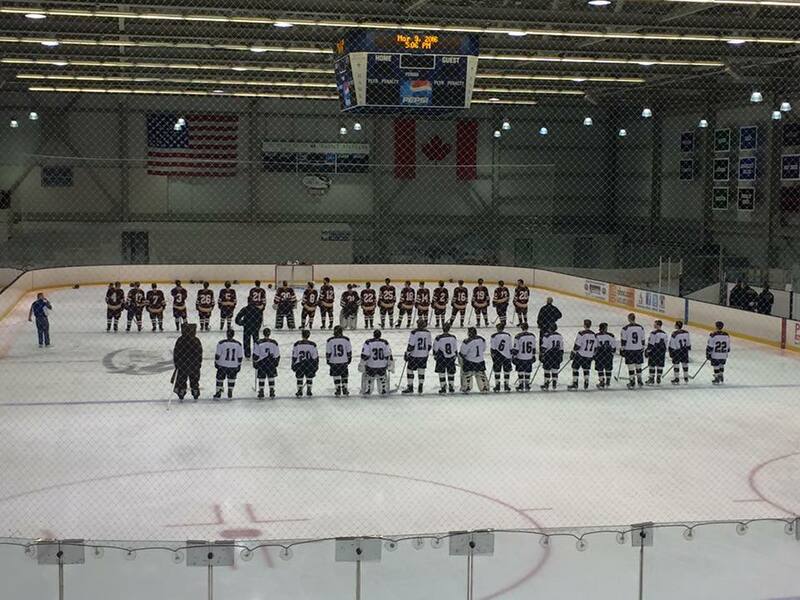 What an overwhelming impact it had on the camaraderie found in the Goffstown Hockey community. I look forward to building on that. The more the merrier, I always say. Did the team and the support group around them have an impact on the Northeast Passage Program? I certainly hope so. Did they have an impact on us? I believe they did. Their tagline is “living beyond disability”. We could all learn from those three words. In fact, we could interject our own word in the blank, “living beyond ____”, and be better for it. How about Senior Night? Impact. The program carries on, but each year somebody’s high school career comes to an end, and while it’s sad, it’s really just another beginning. But, there is without question, impact felt throughout the organization. Then there’s the time on the ice. There’s the beauty of the boldness in the perceived immortality of youth. Did Stephen Provencher have an impact on those who watched him work and go boldly where he never had gone before? Yes. How about Ethan Smith, and his commitment to being the backup goaltender to Holty? Impact? Yes. Did 6’5″ Dylan Hyers come forcibly into contact with another? Oh yes, and it was awesome. There’s Brett Lassonde, and the comments I heard all year about his abilities and tenacity for his size. Well guess what, he’ll keep growing, and he was fantastic regardless of size. Yes, please know that there’s been an impact on more than you know. Mike Fortin, defense, offense, extra attacker, #12 did it all. Impact = tremendous. Noah Charron, did he have an impact? Yes he did. The sophomore led the team in goals and points. What about Tyler Riendeau and his impact? He seems like a field (ice) general, giving direction and feedback constantly. Like it or not, improve your game to match his, and oh yes, there’s an impact. Who remembers being impacted by the theft committed by Max Lajeunesse leading to his game-winning snipe against eventual DII Champs, Windham? Oh, that impact was felt throughout the State of NH hockey circles. Then there was the Griffin Cook, Ben Roy, and Alex McCarthy line. I called them my abacus line, as they wore numbers 5,6, and 7. They teamed up for a beautiful goal early in the season and the senior meshed with the youth, leading by his hustling example, each of them battling to make hockey plays, each having their own impact. These youngsters can play, and their impact will continue to be felt. There’s Colin Burke who started the season as a long, lanky, 14-year-old kid. He was pressed into service against players 4-5 years older than him, but he battled, showed his skills, and worked on improving. Impact? Yes, and I can’t wait to see what he has to offer this program in the coming seasons. There was Sebastian Beal who played his way into consistent ice time, and definitely had an impact on the ice, especially killing penalties. Impact, oh ya. You ask about Jake Noonan and his impact? Sure he impacted others. He got a chance to play along some much more experienced defensemen, which was a tremendous classroom experience right there on the ice everyday. I also hear that alongside his efforts to improve on the ice, he had some pretty good one-liner comments at practices that brought some humor from an unexpected source. Nick Nault had an impact, not only on the number of sticks (his and opponents’) he snapped with his slapshot, but with his skills on the ice. He impacted how other teams defended the Grizzlies power play and offensive rushes up ice. Oh, how many, would be goal scorers, did Colin Holt impact this season? Too many. I think the whole of Grizzlies Nation felt the Holty impact in the overtime victory over Lebanon in the first round, among many examples this season. Speaking of which, could we ever forget the impact of Sam Greenwood on the Raiders from Lebanon in that first round win? Watch the video (GTV on YouTube) of the 1:03 of overtime play. Greenwood made his impact felt in just about every way possible, and he did all season. Yes, there has been an impact up and down this team, and it has been tremendous. Like I said, you never know who is watching, and just who you might be impacting at any given time. I hope this trip through the season in 3,000 words or less, has helped bring attention to this fact. 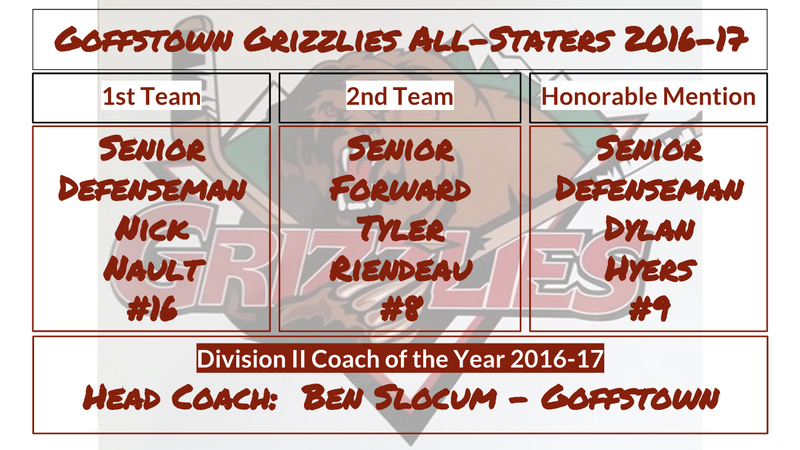 In the end, you, Goffstown Grizzlies Hockey, have impacted us all, and you make us proud. Go Grizzlies! Grizzlies Hockey ~ It’s Quarter-Final Time! It’s Tournament Time, and the Grizzlies have advanced to the NHIAA Division II Ice Hockey Quarter-Finals! The Grizzlies travel to West Side Arena in Manchester, NH to take on the #2 seed, Merrimack Tomahawks. The puck drops at 4pm tomorrow, Saturday, March 12th at West Side Arena. For you Grizzlies’ fans, come out and support your #7 seed, Goffstown Grizzlies. Before I get into this brief preview, full of stats and numbers that often times don’t matter once the puck drops, I have one other thing that does matter, and I have wanted to cover this for quite some time. Recently, a video has made its way around cyberspace providing perfect segway to get this teaching moment off of my chest. I have discussed this with my kids long before this video came around, but I encourage any parent or coach to share this with their kids or their players, early, and often if needed. This is about honor and respect. It’s about our flag, our anthem, our country. My kids will tell you that my favorite song is our National Anthem (it’s true). So, I share this video. Just click on the link and take the 4+ minutes required to watch it. Share it and make sure this generation understands what it all stands for. It drives me crazy when I see players, coaches, or anyone else who can’t stand up straight and quit being a distraction or being distracted long enough to honor our country. Again, this isn’t about views or sides, but about honor and respect; two things that this world could use a lot more of. Thanks. Now, on to tomorrow’s matchup. 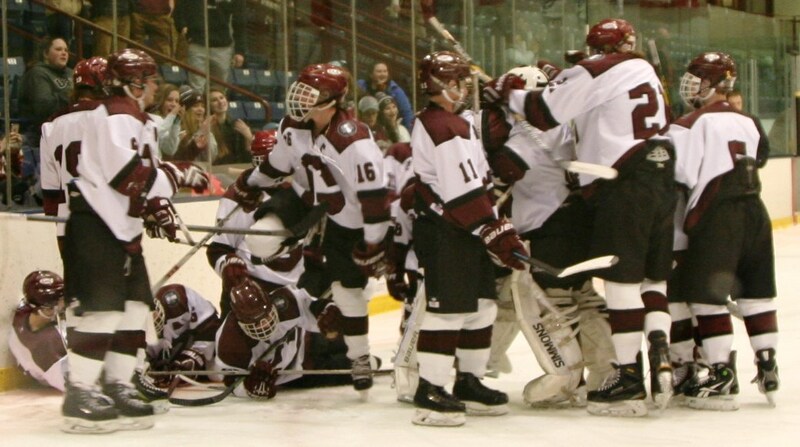 Back on January 6th, Merrimack beat Goffstown 2-0 at Sullivan Arena. It was the first game for both teams after the Christmas break, and a lot has happened since then. After the win on January 6th, Merrimack would lose 3 games in the next 5 days. They haven’t lost since. The Tomahawks finished the season with a 13-3-2 record, and haven’t lost since January 13th (10-0-2 in the streak). Goffstown has a style all their own. The Grizzlies are the lowest scoring team of the 10 teams that qualified for the Tournament. Goffstown has struggled to find the net at times, both getting pucks to the net, and getting pucks into the net. But man, do they compete?!?! They just won’t go away. It’s a beautiful thing. When the Grizzlies tangled with the Tomahawks in early January, both teams had 21 shots on goal. The Grizzlies trailed 1-0 for most of the game, right up until Merrimack scored an empty net goal with 20 seconds left in regulation. Obviously, no team is any hotter than the white-hot Tomahawks. Then again, they haven’t played a meaningful game since Feb. 25th. By tomorrow, that will be 16 days since they last played. The Grizzlies are now 6-2-1 in their last 9 outings and have started to generate some momentum themselves. Anything can happen as we all know, and tomorrow we will find out if any of these numbers mean a thing. 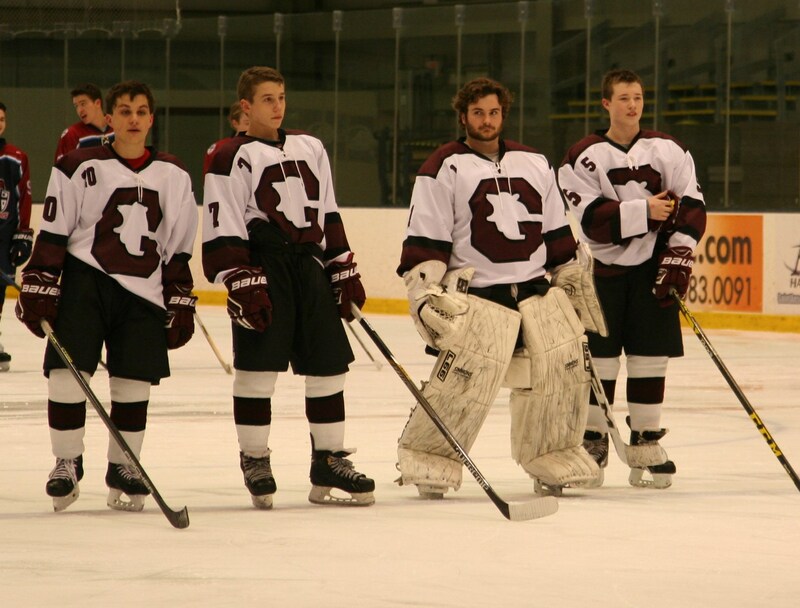 The Grizzlies are led by seniors, Colin Holt (G), Sam Greenwood (F), and Ben Roy (F). 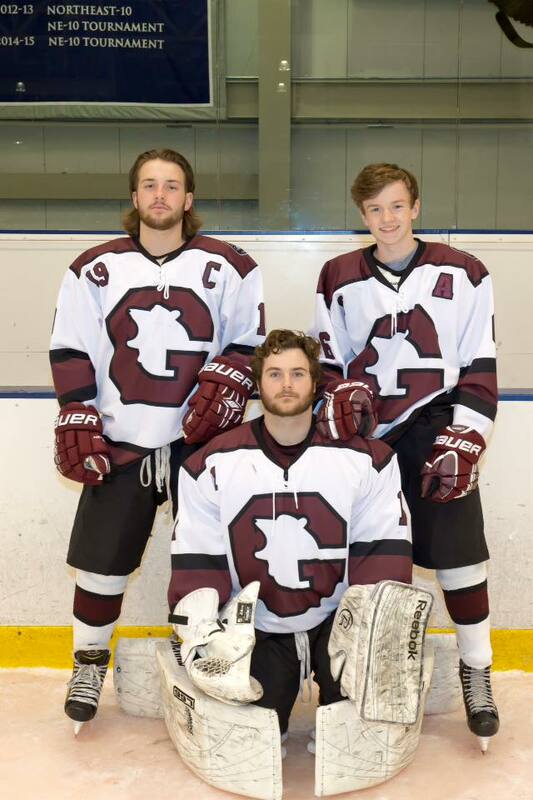 The Goffstown juniors are, Tyler Riendeau (F), Nick Nault (D), and Dylan Hyers (D). Goffstown is loaded with freshmen and sophomores, starting with 2nd year players, Mike Fortin (F-D), Max Lajeunesse (F), Ethan Smith (G), Noah Charron (F). The freshmen are, Stephen Provencher (F), Colin Burke (D), Jake Noonan (D), Brett Lassonde (D), Alex McCarthy (F), Sebastian Beal (F), and Griffin Cook (F). The coaching staff is led by Head Coach Ben Slocum (1st year), and Assistant Coaches, John Nanoff and Shane Tufts. Grizzlies Hockey ~ It’s Tournament Time! It’s Tournament Time! The Grizzlies host Lebanon tomorrow night (Wednesday 3/9 at 5:00pm @ Sullivan Arena) in the prelim round of the Division II Hockey Tournament. The Grizzlies earned the #7 seed and will host the #10 seed, Lebanon Raiders. The winner of Wednesday night’s game will advance to play #2 seed, Merrimack on Saturday afternoon. It wasn’t too long ago, when the Goffstown Grizzlies Ice Hockey team found themselves mired in mediocrity. They were hovering at .500 with a 5-5 record, and were in the bottom half of the standings. It was the end of January and they were looking up at most of the division, with games against perennial powerhouses, Dover and Spaulding staring them in the face. Throw in a 10-day layoff, a hole in the schedule if you will, and the Grizzlies went to play at Dover on February 10th. As it turned out, the Grizzlies beat Dover and Spaulding back-to-back and started to shape their season in a different manner. The Grizzlies would end up going 5-2-1 over their last 8 games and would catapult up the standings from as low as 12th, all the way to 7th seed, and hosting a first round tournament game. Goffstown will play host to the Lebanon Raiders whom they tied 2-2 up at Campion Rink less than two weeks ago. The Raiders finished in the #10 spot by finishing strong, going 6-2-1 down the stretch, ending the regular season with an 8-8-2 record. For some notes that we can compare, between these two teams, I give you the following. Both Lebanon and Goffstown played several common opponents this season. Among the common opponents, the edge goes to the Grizzlies, Goffstown was 8-7, while Lebanon was 5-8 against teams they played in common. Against teams that qualified for the tournament, again the Grizzlies had the advantage, going 3-7-1 while the Raiders were 0-7-1 against playoff contenders, the one tie being against the Grizzlies. Both teams finished the regular season on a strong note. Combined, they were 11-4-2 down the stretch. They played each other recently which should make for an even more exciting matchup in the first round. In their meeting on Feb. 27, the Grizzlies made a long bus ride on a Saturday afternoon on the final weekend of Feb. vacation week, just hours after losing a physical battle against the Keene BlackBirds. After the first period in that game, the Grizzlies carried the play for the most part. Then again, this is why they play the games. Anything can happen out there. The Goffstown Grizzlies are playing their final home game of the 2015-16 season on Wednesday night, and it happens to be a Tournament game. So, Grizzlies’ Nation, come out and wear your maroon, have fun, and be loud! I can tell you that after being at Sullivan Arena on Sunday for the 2016 NEPSAC (Prep Schools) Ice Hockey Championships, where nobody was a ‘home’ team; it can get really loud in the arena at St. Anselm College. So come out and support the Grizzlies Hockey team on Wednesday at 5pm.